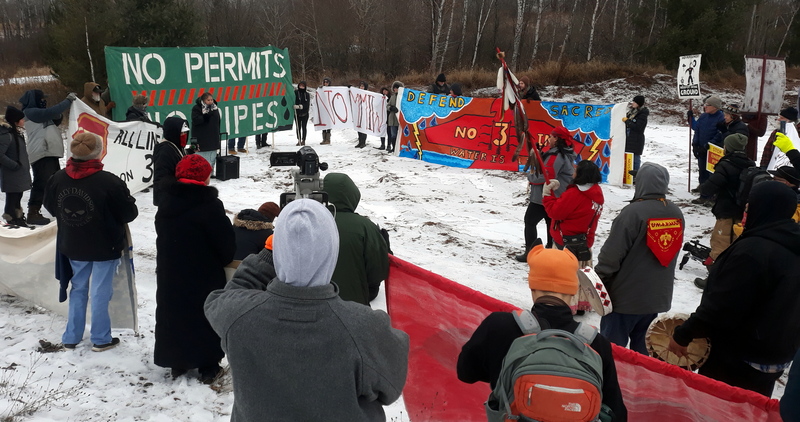 Photo from a recent rally held at one of Enbirdge’s pipeline storage yards, protesting that Enbridge got storage yard permits under false pretenses. Journalist Tom Brokaw coined the term “Greatest Generation” as the title for his 1998 book about those who grew up during the Great Depression then fought in World War II, defeating the Axis Powers and their fascist designs for the world. It might be jarring to some to make a comparison between Brokaw’s Greatest Generation and this upcoming generation of water and climate protectors, but hear me out. First, those who fought in World War II — and those who supported them on the home front — should be honored for their incredible sacrifices and accomplishments. But surely they can’t be our final Greatest Generation. I don’t believe the members of the Brokaw’s Greatest Generation would even want that. If that were true, that would mean we’ve peaked as a nation, nothing left but a sad string of good-to-mediocre generations. Our country and our world need to keep lifting up “Greatest Generations.” With growing populations, more deadly hurricanes and wild fires, rapid technological advances, deep political divisions, and seemingly unlimited greed, our problems will only get more complex and challenging. We are in constant need of Great Generations. Photo from a recent Public Utilities Commission hearing where the public had to walk by a heavy security presence. We are able to view the ‘Greatest Generation’ from a perspective of 70-plus years. We can look back, see the sacrifices, and know how the story ends. For the climate protectors, we can’t see the sacrifices that still lay ahead. We have some hints. Those at Standing Rock faced an overwhelmingly violent response from law enforcement and private security guards. 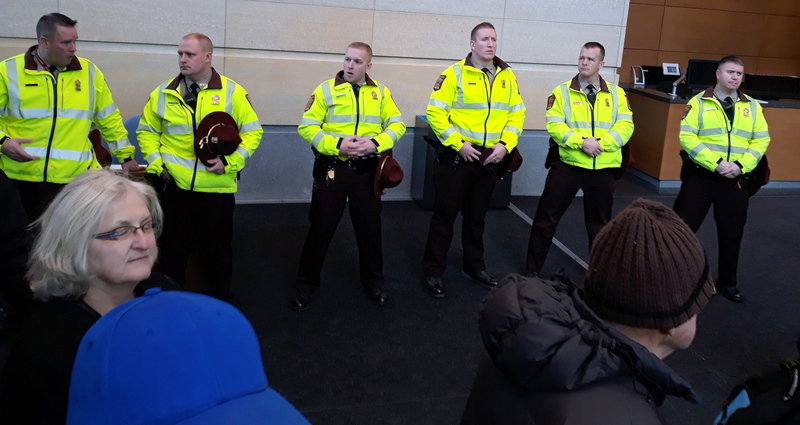 Here in Minnesota, the Public Utilities Commission used an unnecessarily heavy and intimidating police presence at public hearings on Enbridge Line 3. Climate and water protectors are following in the path of those who fought for women’s suffrage, civil rights, and other causes of justice. They are standing up to the powers-that-be, both political and economic, to reduce our use of fossil fuels and create a green economy with good paying jobs. We don’t know yet what their achievements might be. But if they fail — if we fail — the result will be as devastating or more so than had we lost World War II. As we enter this New Year, I am grateful for the leadership provided by indigenous peoples and youth of all colors on this critical work.